Part eight of a series from the 2008 Suwannee Dulcimer Retreat at Stephen Foster Folk Culture Center State Park in White Springs, Florida. 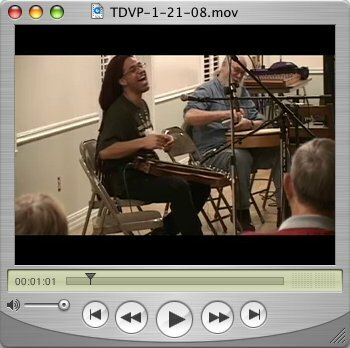 In the finale; Steve Eulberg plays a trio of songs on hammered dulcimer, David Beede performs "Mocha Run" on gourd banjo and it's home again, home again, jiggety jiggy. Part seven of a series from the 2008 Suwannee Dulcimer Retreat at Stephen Foster Folk Culture Center State Park in White Springs, Florida. In this episode, two duos in evening concert; Bing Futch joins Mary Z. Cox on "John Stinson's #2" and Aaron O'Rourke joins David Beede on David's original "meta-protest song" "Shadow of Dylan." Part six of a series from the 2008 Suwannee Dulcimer Retreat at Stephen Foster Folk Culture Center State Park in White Springs, Florida. 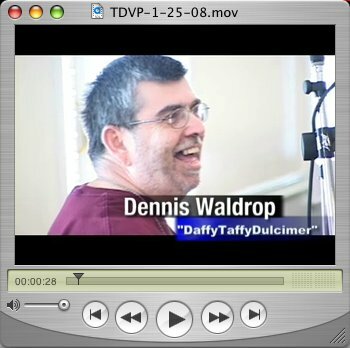 Dennis Woldrop, EverythingDulcimer.com member and co-founder of the Florida Sunshine Dulcimer Society, performs a song that he wrote earlier in the day during Joel Paul's workshop. Then, Joel Paul stills the audience with his original composition "Los Frailes." 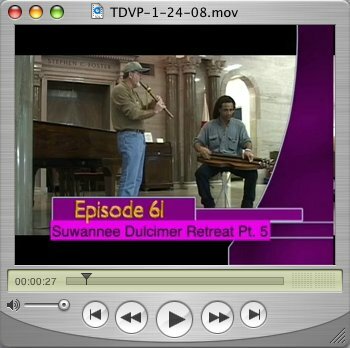 Part five of a series from the 2008 Suwannee Dulcimer Retreat at Stephen Foster Folk Culture Center State Park in White Springs, Florida. Bing Futch and John Hawk prepare for their upcoming Appalachian mountain dulcimer and Native American Flute CD with some improvisational recording in the carillon tower. 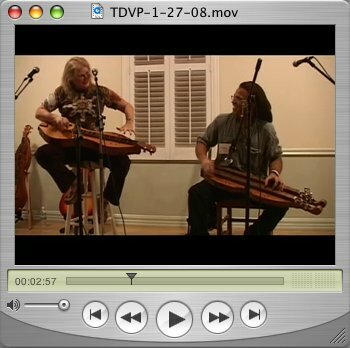 Part four of a series from the 2008 Suwannee Dulcimer Retreat at Stephen Foster Folk Culture Center State Park in White Springs, Florida. 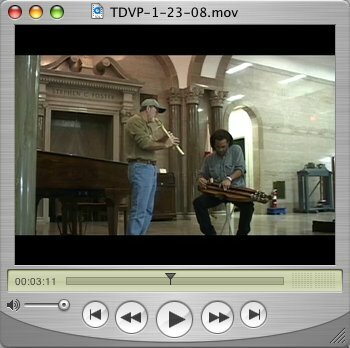 Bing Futch and John Hawk prepare for their upcoming Appalachian mountain dulcimer and Native American Flute CD with some improvisational recording in the carillon tower. Part three of a series from the 2008 Suwannee Dulcimer Retreat at Stephen Foster Folk Culture Center State Park in White Springs, Florida. There's a whole lot of music in this episode, starting with the after-concert jam at the Telford Hotel in White Springs, where retreat organizer David Beede and instructors Susan Bayer Haley, Karen Mueller, Aaron O'Rourke, Mary Z. Cox and Steve Eulberg join in for some "Shortnin' Bread." 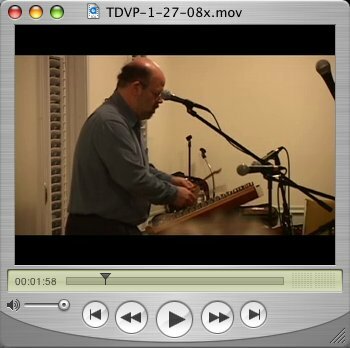 Then, a glimpse at Steve Eulberg's hammered dulcimer class on Saturday morning. 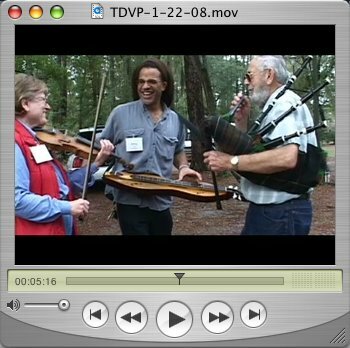 Finally, Bing Futch joins Jack and Joan Robertson in a mountain dulcimer, fiddle and bagpipe trio (quartet, if you count the carillon) and gets a lesson in how to play the bagpipes! First episode of the new season featuring a short discussion of movie themes by composer John Williams leading into a demonstration of "Theme From 'Jurassic Park'". Thanks to Matthew Hathaway for the inspiration for this episode and Butch Ross for the closing theme.